Above: a production image from Carolee Schneemanns's Up To And Including Her Limits video,1976. 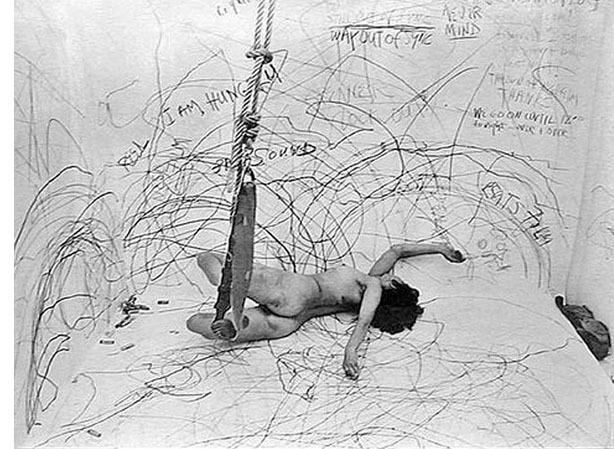 Carolee Schneemann's talk/performance, a co-presentation of Gallery One One One and the Faculty of Architecture's Arch 2 Gallery, will happen at 7 pm at the Russell Building's Centre Space on the Fort Garry Campus. Carolee Schneemann is one of America's most important post-war artists, and she has a special affection for Winnipeg. She last visited the School of Art in the year 2000. Her video Up to and Including Her Limits from the mid-1970s is especially important as an historical marker made halfway between the action painting of Jackson Pollock (to which it/she explicitly refers as an inspiration) and the recent "Drawing Restraint" performances of Matthew Barney. This exhibition is part of the series BLACK BOX: VIDEO PROJECTIONS AT GALLERY ONE ONE ONE, September - March 2010/11. Gallery One One One's Autumn and Winter season will be exclusively devoted to exhibitions of video projection, during which the gallery will be transformed from a white cube into a black box. Gallery One One One Director Cliff Eyland, with Prof. Alex Poruchnyk as a curatorial consultant, will curate this set of exhibitions. Gallery One One One gratefully acknowledges the support of The Manitoba Arts Council, School of Art staff and volunteers, Carolee Schneemann, and curatorial consultant Alex Poruchnyk.